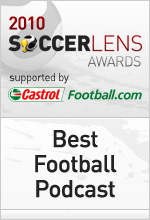 1) You’ve been nominated for Best Football Niche Site, chosen by both fans and industry experts, how does it feel? I’m absolutely delighted, but a little embarrassed to be in with such terrific company. It’s a nice reward for all those hours spent trying to work out what html code means. I love the writing, but the technical side of things often goes way over my head. 2) What kind of year has 2010 been for European Football Weekends? Splendid. EFW has grown enormously in terms of site visitors. The Facebook page now has the thick end of a thousand members who help each other out with ticketing and travel information. I also helped organise the second EFW Oktoberfest which was a huge success with around 40 likeminded souls from all over Europe travelling around Hungary and Slovakia watching games involving teams we’d never heard of. A 400 kilometre round trip to see Zalaegerszegi Torna Egylet on a Friday night? The sort of stuff dreams are made of, no? I started interviewing my favourite people in football; Barry Glendenning, James Richardson, Kevin Day, Sid Lowe et al, and those went down really well. I also started to let other people write on EFW, those who actually know how to wield a pen, and so guys like Dan Richardson (Britski Belasi), Andy Hudson (Gannin’ Away), Nick Ames (Arsenal FC programme), Ulas Gürsat (Turkish daily Haberturk newspaper) and a few more chaps contributed some cracking articles which helped fill the gaps in between my nonsense. Well, in my category it would be a close call between Zonal Marking and Swiss Ramble. There is nothing those two chaps don’t know about the game between them, and that’s reflected in their sites, both of which are magnificent. I’ve cast my vote for In Bed With Maradona in the new website section. Those guys have put together one of the best football websites I’ve ever seen. There’s a new gem to read on there everyday, and they think outside the box as well, which I like. 5) What’s next for European Football Weekends? I really should learn how to use a computer properly. I would like to change from Blogger to WordPress, and improve the look of the site – it’s just finding the time. I’ll continue to write about European and non league football, and try and avoid the Premier League if I can. Then there’s interviews, a trip to the Berlin derby, Lewes FC, the EFW Oktoberfest to organise, a book, cuddly toy, is anyone still reading this? I have. Messi and Ronaldo, who knew? The rankings are good, the players are all great, obviously, but if I’m being honest, I prefer fans to players. The last player I really worshiped was Bobby Zamora at Brighton. I know it’s bad, but when I’m bouncing along the terraces at Spartak Trnava, I can’t help but enjoy the actions of the fans more than what’s actually occurring on the pitch. I don’t, in truth, watch that much Premier or Champions League football either. Give me the Conference South or the Slovak First Divsion any day of the week.